This is partly a question about Tesla, but it’s more interesting as a way to think about what happens when ‘software eats the world’ in general, and when tech moves into new industries. How do we think about whether something is disruptive? If it is, who exactly gets disrupted? And does that disruption mean that one company wins in the new world? Which one? To begin: the idea of ‘disruption’ is that a new concept changes the basis of competition in an industry. At the beginning, either the new thing itself or the companies bringing it (or both) tend to be bad at the things the incumbents value, and get laughed at, but they learn those things. Conversely, the incumbents either dismiss the new thing as pointless or presume they’ll easily be able to add it (or both), but they’re wrong. Apple brought software and learnt phones, whereas Nokia had great phones but could not learn software. However, not every new technology or idea is disruptive. Some things do not change the basis of competition enough, and for some things the incumbents are able to learn and absorb the new concept instead (these are not quite the same thing). Clay Christensen calls this ‘sustaining innovation’ as opposed to ‘disruptive innovation’. By extension, any new technology is probably disruptive to someone, at some part of the value chain. The iPhone disrupted the handset business, but has not disrupted the cellular network operators at all, though many people were convinced that it would. (For all that’s changed, the same companies still have the same business model and the same customers that they did in 2006.) Online flight booking didn’t disrupt airlines much, but it was hugely disruptive to travel agents. Online booking (for the sake of argument) was sustaining innovation for airlines and disruptive innovation for travel agents. Meanwhile, the people who are first to bring the disruption to market may not be the people who end up benefiting from it, and indeed the people who win from the disruption may actually be doing something different - they may be in a different part of the value chain. Apple pioneered PCs but lost the PC market, and the big winners were not even other PC makers. Rather, most of the profits went to Microsoft and Intel. PCs themselves became a low-margin commodity with fierce competition, but PC CPUs and operating systems (and productivity software) turned out to have very strong winner-takes-all effects. Being first is not the same as having a sustainable competitive advantage, no matter how disruptive you are, and the advantage might be somewhere else anyway. Second, Tesla also has to be doing new things that the incumbent car OEMs will struggle to learn. This is not quite the same as doing things that the OEMs’ suppliers will struggle to learn. Fourth, in addition to all of these there needs to be some fundamental competitive advantage, not just over the existing car industry but also over other new entrants. Apple did things Nokia could not do, but it also does things that Google cannot do. Now, let’s talk about what’s happening in cars. This is complex, because there are several somewhat separate changes happening at the same time. Meanwhile, electric is not just about replacing the fuel tank with a battery. Electric disrupts the internal combustion engine and everything associated with it - you remove the whole drive train and replace it with something with 5 to 10 times fewer moving or breakable parts. You rip the spine out of the car. This is very disruptive to anyone in the engine business - it disrupts machine tools, and many of the suppliers of these components to the OEMs. A lot of the supplier base will change. This is not the same as disrupting the OEMs themselves. 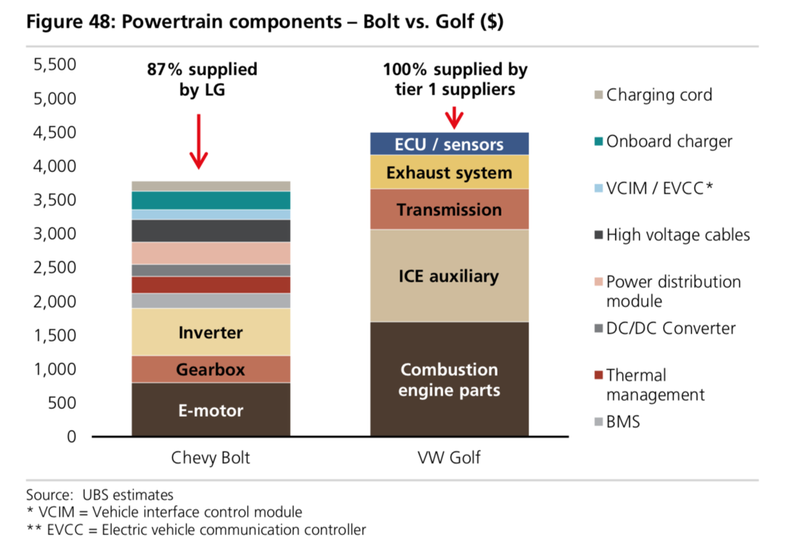 If the OEMs can buy the components of an electric car as easily as anyone else, then the advantage in efficient scale manufacturing goes to the people who already have a lead in efficient scale manufacturing, since they’re doing essentially the same thing. In other words, it’s the same business, with some different suppliers, and electric per se looks a lot more like sustaining innovation. If the components will be a commodity, integrating them may not be - at least, not necessarily. First, the integration of the electric drive train components themselves is not trivial, and doing it better can get you more efficiencies. This is one of the places where Tesla probably has an engineering lead, today. What’s not clear is how big that lead will be in (say) five years, and quite what competitive advantage it gives. If, for the sake of argument, Tesla has a 10% or 20% advantage on range at a given price, this matters for a touring sedan, but does it also matter for a minivan doing the school run, that drives 10 miles a day and parks in a garage with a charging point every night? How much of a competitive advantage will that be in 10 years, compared to all the other factors that people use to choose a car? Is this a margin advantage, a competitive advantage, or just a checkbox to be compared with other features? We’ll see. This is clearly a challenge to the suppliers who make those separate systems, and there are also plenty of reasons why this might be hard for an incumbent car company to adapt to (most obviously, that org chart). This is also exactly the sort of thing that non-tech companies tend to think will be easy (‘we’ll just hire some developers!’), and instead make into a horrible mess, and they may have to go through a cycle of learning that they don’t do it well themselves before buying it from someone who does it better. That is, this looks a lot more like disruption than electric itself does. Tesla is of course already here, which is why it could fix a brake problem in the Model 3 over the air - the code it needed to change wasn’t in the brakes. There are other cool things that come from the de novo model. Outside the car itself, Tesla can sell direct on a fixed price instead of going through dealers. OEM dealers often have contracts around who can install new software (so no remote updates allowed) and those dealers make most of their profits from repairs. Around half of repair spending is on things directly linked to the ICE - no ICE means no oil leaks or broken fan belts. Dealers also play an important role in setting pricing and incentives, and driving demand to specific models. These are all more things that are hard for the incumbent industry to adapt to. This is of course very subjective (“how much does this cool thing matter?”), so here’s a thought experiment: if these factors were the only difference between a Tesla and a BMW or Mercedes, and the drive train, acceleration etc were all identical, would they be enough? If BMW suddenly started selling direct and doing seamless OTA firmware uptakes, would Tesla’s share price collapse? Probably not. If this pays off, it would indeed be a profound and compelling competitive advantage for Tesla, even without thinking about all the other possibilities, such as renting your Tesla out as an autonomous taxi. Unfortunately, computer vision is not yet able to do this well enough. Most people in the field would agree that this will be possible at some point (after all, humans don’t have LIDAR), but it’s not possible yet. Moreover, this isn’t a question of just adding more data and getting vision to work by brute force (or at least, we don’t know that it is). This is why pretty much everyone else is using vision combined with multiple LIDAR sensors and often multiple radar units as well. Today, that adds tens of thousands of dollars of cost to each vehicle. If you’re only running an engineering testing and development fleet of at most a few dozen or hundred vehicles, this is bearable, but it’s clearly not possible to add this to every new Tesla Model 3 - the sensors would cost more than the car. (There’s also the issue that you have to add bulky, fragile and impractical lumps all over the car.) The cost and size of these sensors is falling fast (for example, there is a race to get the first solid-state LIDAR working), but we are still some years away from their being cheap enough to put on a production car. Hence, Tesla’s first bet is that it will solve the problem of building a model of your surroundings using only vision before the other sensors get small and cheap, and that it will solve all the rest of the autonomy problems by then as well. This is strongly counter-consensus. It hopes to do it the harder way before anyone else does it the easier way. That is, it’s entirely possible that Waymo, or someone else, gets autonomy to work in 202x with a $1,000 or $2,000 LIDAR and vision sensor suite and Tesla still doesn’t have it working with vision alone. The second bet is that Tesla will be able to get autonomy working with enough of a lead to benefit from a strong winner-takes-all effect - ‘more cars means more data means better autonomy means more cars’. After all, even if Tesla did get the vision-only approach working, it doesn’t necessarily follow that no-one else would. Hence, the bet is that autonomous capability will not be a commodity. This is really a question about all machine learning projects: at what point are there diminishing returns as you add more data, and how many people can get that amount of data? It does seem as though there should be a ceiling for autonomy - if a car can drive in Naples for a year without ever getting confused, how much more is there to improve? At some point you’re effectively finished. So, how many cars gathering data do you need before your autonomy is as good as the best on the market? How many companies might be able to reach that? Is this 100 or a thousand cars driving for a year, or 1 million cars? And meanwhile, machine learning itself is changing quickly - one cannot rule out the possibility that the amount of data you need might shrink dramatically. So: it’s possible that Tesla gets the vision-only approach to work, and gets the rest of autonomy working as well, and its data and its fleet makes it hard for anyone else to catch up for years. But it’s also possible that Waymo gets this working and decides to sell it to everyone. It’s possible that by the time this starts to go mainstream, 5 or 10 companies get it working, and autonomy looks more like ABS than it looks like x86 or Windows. It’s possible that Elon Musk’s assertion that it should work with vision alone is correct, and 10 other companies then get it working. This post began as a much shorter piece about Tesla and Netflix, comparing two companies that are using software to change other industries. But the fascinating thing about Tesla is that there are so many different things going on, and so many different kinds of innovation. I’m sure I’ve missed plenty of things. One of the issues that recurs in thinking about Tesla is that tech people don’t really know enough about cars, and car people don’t really know enough about software.